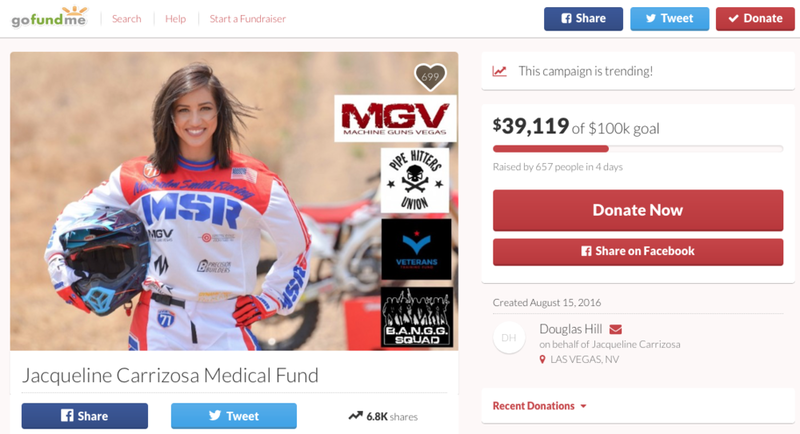 Jacqueline Carrizosa, "BROJAQ", a Veterans Training Fund ambassador and one of the Machine Guns Vegas Range Safety Officers was injured over the weekend in a motorcycle accident while training for a 640-mile Ironman race. Although she was in critical condition for a time, Jacque is reportedly in stable condition now and beginning her recovery. To that end we’ve been advised that PHU (Pipe Hitters Union Her participation in the race was to raise funds for the VTF. 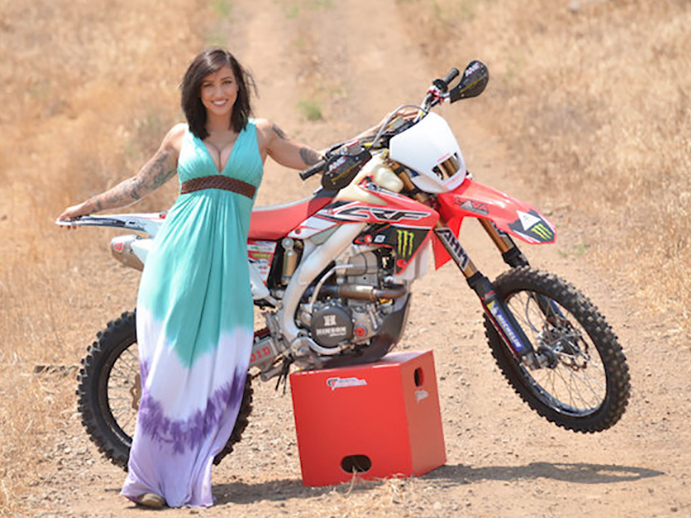 That race, the General Tire Vegas to Reno, would have marked the first time a female military veteran took part (Jacque was to ride a Honda 450x), and included 300 competitors. It was due to launch just a couple of days from now, with proceeds from her fundraiser going directly to VTF scholarship funds. Her goal was to raise $50,000. "Ever feel like you've been hit by a truck? 🚚💨 So, I can finally make a coherent enough post to really really appreciate everything that has happened this last week. Sunday morning I was cycling on my roadbike a 30 mile round to keep up with training and was struck by a Ford Raptor to my backside going 65mph+. The road I was on, did have four lanes. No, I wasn't the only biker at night and yes, I do have crazy amounts of lumen lights. My front light alone has 800 lumens and light the whole street up. I was wearing @bell_powersports Helmet that indefinitely protected my brains, but was not a full face. The driver did claim they were distracted but nothing is set in stone yet. I have a fractured spine in the lumbar and thoracic and have one kidney hanging on by a thread. My second kidney is trying to be the tough guy. My whole body is covered in road rash and is super swollen. I'm very lucky and happy it wasn't worse. I am still in the hospital and we are still working on keeping my kidneys. I have a back brace I will have to wear. 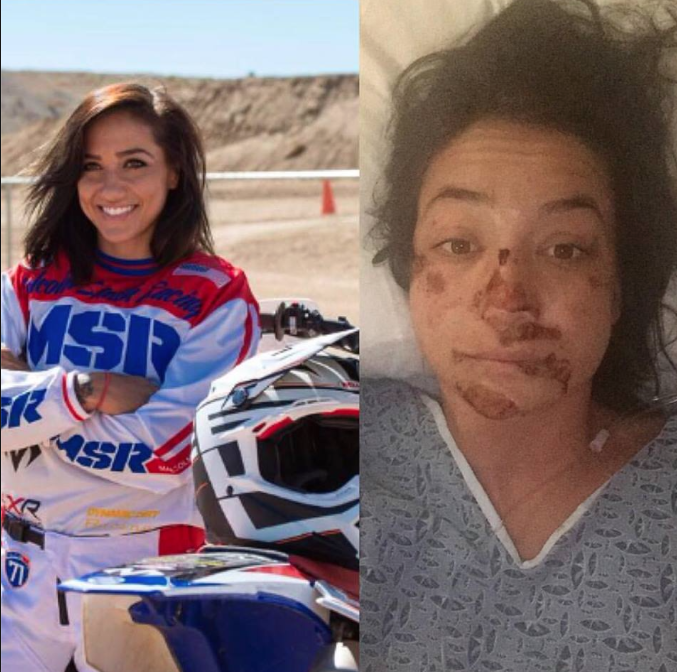 I am super bummed that I won't be able to race the @bestinthedesert ‪#‎vegastoreno2016‬ tomorrow due to these severe injuries that just happened. My team worked really hard on prepping everything and helping I wish I could have made them proud this year and raised the money for the veterans was my sole goal. I'm doing my best to know that this was very out of my hands and the best thing I can do now is focus on healing and moving forward. My family and friends and work have been the best I could've ever asked for during this. They've been so supportive and understanding. Here's to starting everything over with a clean slate, I can't wait to see where this takes me now. Thank you to EVERYONE for all the well wishes. The original Veterans TrainingFund go fund me will go to the veteran charity STILL. The @pipehittersunion was awesome to set one up for me while I was in surgery and had no clue. Thanks so much everyone, seriously. You make my heart very happy. ☀️💛 ‪#‎apologizeinadvanceformyface‬ 😬"